Again the list is standard so searching and finding SMSs sent is simple. 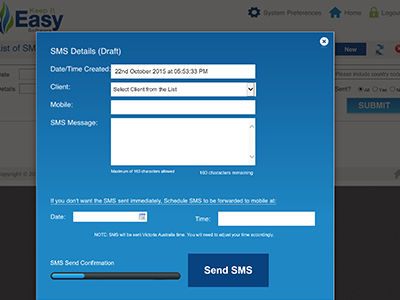 You can schedule sms to be sent at a later time or immediately and you can save drafts. Send to a customer or to any mobile number you enter, no more fumbling with little phones, use your computer. You can create as many standard letters, quotes, advertisements as you wish and edit them any time. Basic editing features are available within the software. The letter will then appear in the list for you to select and send to your clients. 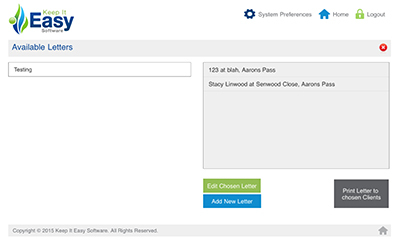 You can send a letter to bulk clients from the Client list. When you have chosen the clients and said yes to sending letters you will get this screen, select the standard letter you want or make a new one then click the Print letter button and that’s it, done.